As the musical world continues to mourn the loss of one of its brass treasures, Rolf Smedvig, two book ends of his professional life have agreed to share some of their thoughts. An International soloist, principal trombonist of the Boston Symphony Orchestra (BSO) and recipient of the International Trombone Association Lifetime Achievement Award, Ronald Barron is a towering oak of brass expertise. His experience with Rolf at Tangledwood and with the BSO predates the Empire Brass. To capture the final years of Rolf’s tenure with Empire, we have sought out his longest serving sideman-Ken Amis. The rock solid anchor of Empire Brass for the past 22 years, Amis is still with the group and is contributing towards its continued efforts. “FIVE!” is proud to present the thoughts of this outstanding tubist/composer and legendary trombonist as they more fully color the musical personality of Rolf Smedvig. Enjoy! 1. What was Rolf’s concept of time like for the group? Rolf always wanted the time to be dominant property around which all the expression was made. Expressed through an fast articulation, the time always established a groove in every piece we played. 2. Do you feel that the tuba is under utilized in most brass quintet literature? Why do arrangers seem reluctant to allow the trombone to carry the bass function and allow the tuba to sing? I don’t feel that the tuba is under utilized in most brass quintet literature. Writing tuba solos that don’t sound pretentious, gimmicky or musically unbalanced is difficult and doesn’t lead itself as readily to many pieces. It’s not that composers are reluctant to allow the trombone to carry the bass. It is often the difficulty of including a tuba solo in the music that limits such a rendition. 3. What were the distinct aspects of the Empire Brass approach which separated them from other groups? Empire Brass has a style of playing that produces a big sound and the very front of an articulation that differentiates it from most groups. The groups commitment to establishing a musical, metronomic pulse also makes its sound unmistakable. 4. Which other brass groups have inspired you? A Ray Charles performance at Tanglewood in the mid-90’s. 5. What are your favorite EB recordings, and why? Class Brass and Class Brass: Firedance are my favorite recordings due to repertoire and clarity and balance with which the playing was captured by the microphone placement and recording techniques. 6. What are your favorite memories of Rolf? Playing Sleepers’ Wake and the 3rd movement of the Elizabethan Dance Suite were my favorite moments. 7. How many years were you with EB, did your playing change as a result of your EB experience? I have been in Empire Brass for 22 years. Hopefully, I have shown some improvement in the way I play for non-musicians. 8. What were some of the most memorable live performances you experienced with EB? Suntory Hall in Tokyo, Japan is memorable because of the venue. A concert we played in Taiwan is memorable because of the audience. 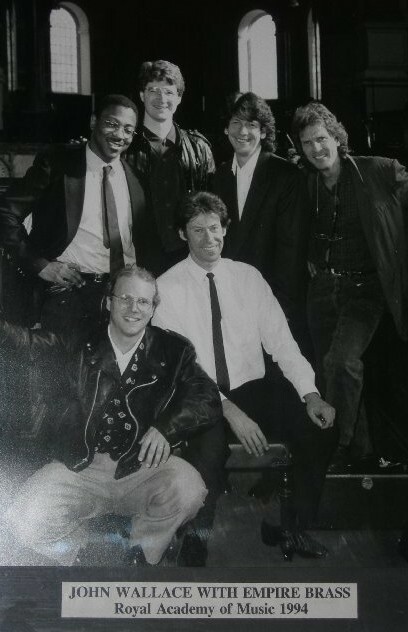 The concert we played in Wilton, CT is memorable because it was Rolf’s last performance with the group. 1. Please describe Rolf early in his career as a symphonic player and the birth of the Empire Brass. When I heard of Rolf at BUTI in 1971, everyone said he had the sound to be a star soon. This turned out to be true. His warm lyric beautifully resonant quality made him an easy standout at his BSO audition, and he followed Roger Voisin in the assistant position, though not playing first in Pops as Andre Come had taken over that in the year after Roger, and Andre kept that spot during Rolf’s time in the BSO. I always enjoyed blending with Rolf, it was easy. I had more opportunities for that after getting the principal position in 1975. I was not an original member of the quintet when they formed and I was a bit skeptical about the future of such a group. 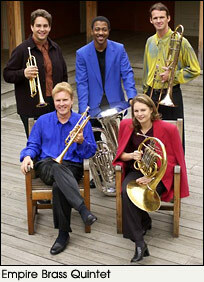 Canadian had begun only the previous few years and trying to do brass chamber music full time was a new concept. However, through extremely devoted hard work, they made it happen. Any road life style is not easy and they needed to do the BU residency and association and the teaching component to be stable. I think the history speaks for itself, they made it happen. 2. What was your involvement with Empire, and your favorite recordings? My involvement with Empire started in Sept. 1975 and lasted for three weeks. My life was simply too full for the demands of the group, so Norman joined and had a great run with them for six years or so. Afterwards, I was part of some recording projects when they wanted larger ensembles. Many fine recordings: the Ewald quintets were a new and great presentation; after Rolf’s death, I listened to Bernstein’s Simple Song from the Mass featuring Rolf, just marvelous, great touch and feeling, just as I want it to be. 3. Having recorded with both Canadian and Empire, how would you describe the differences in their approach. I had the unique pleasure to be part of three recordings of similar repertoire with Canadian, Empire and Summit Brass all in the same year, 1988. These recordings are different enough to discuss your question. The repertoire was Venetian, 16th and 17th century, Gabrieli, etc. The Canadian one was grand in a cathedral way, it was 15 players, Boston Symphony, New York Phil. and Canadian brass. Very sonic and grandioso. The Empire one was perhaps the best raw brass playing, very brilliant, polished, driven and exciting. Neither of these were restrained or particularly stylish for the repertoire, but they sounded terrific. The Summit Brass example was more elegant, nimble, not as much in your face as Empire. All were wonderful for what they were, but it was an excellent opportunity to compare feelings and style. I would not suggest which one was best, as each has their merits and appeal. Certainly the Empire one was exciting! As for direct comparisons with Canadian and Empire, the Canadian approach soon became quite commercial and led to their success. Empire tried to keep it more serious and did for a while, but eventually realized the need to be more broadly commercial to remain in business. I think any brass ensemble eventually needs a strong commercial component if they wish to be financially self sustaining. After all, the instruments sound great in commercial music, jazz, etc. We were not intended for the delicate gentile salon; and there is simply not a dearth of great repertoire from the great names of what we call classical music. 4. Can you address your solo experiences as a brass player, and Rolf’s? How do you believe it informed the underpinning philosophy of EB? I felt the need to pursue a solo career to the extent I could while in the orchestra as a balance to the routine parts of the job. It helped, and kept me sane through many years. Rolf decided that the solo and chamber world was essential for him and he needed to leave the orchestra to fulfill that desire. He made the right choice in that he was successful for a long time. The other members had their own ambitions naturally, but I can not say with any authority how extensive a solo career all of them had or have now. Probably somewhat, one would have to do an analysis. Many have gone on to orchestra positions, many have not. I feel the example set by Rolf and his comrades in starting and maintaining the EBQ for so long made the next generation of brass players have hope for such an ensemble and its future. Things evolve, tastes change, and nothing is static, but it opened a new avenue for an aspiring young person. Between Canadian and Empire the standard was set and so many of today’s brass ensembles own a debt of gratitude to them. Interested in more “FIVE!” tm Interviews?